Can You Have Your Fish and Eat It, Too? 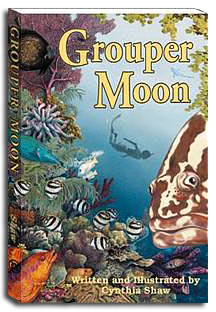 An exciting option for the classroom or home school as a science-language arts-social studies connection is Grouper Moon, a kids' novel by Cynthia Shaw that artfully blends science and fiction. This delightful story of an island boy and an affable Nassau grouper entertains readers while teaching them about very real coral reef and fishery conservation issues. "It has been a wonderful class experience," writes Louise Marquering, who used Grouper Moon in her 7th grade classroom at Hamilton Creek School in Lebanon, Oregon. "It really held the students' interest and is up there with My Side of the Mountain and Where the Red Fern Grows for favorite stories. I appreciated the tie-in with our survey of the animal phyla as we studied structure and function of all animals. It also allowed me to integrate my diving experiences and pictures with both literature and science." Read more about Can You Have Your Fish and Eat It, Too? 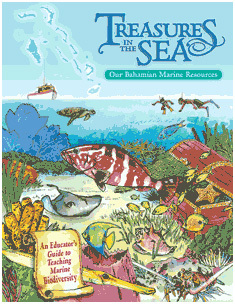 Treasures in the Sea is a resource book that provides teachers with scientific information and engaging, hands-on activities that encourage students to discover, cherish, and protect the sea and all of its treasures. What is being done to protect Nassau grouper? A social and ecological cornerstone of Caribbean coral reefs, the Nassau grouper is a Caribbean icon. Normally solitary and territorial, during the winter full moons grouper travel, sometimes over great distances, and “group” together to spawn at the same sites every year. The predictable nature of these spawning aggregations renders them vulnerable to overfishing, and now one-third to one-half of the originally known spawning sites in the Caribbean are inactive. In 2002, the Reef Environmental Educational Foundation (REEF) launched "The Grouper Moon Project" - a collaborative effort with the Cayman Islands Department of Environment to study the last remaining active Nassau grouper spawning aggregation in the Cayman Islands.